A fast and easy cabbage steak recipe with bacon and garlic! Learn how to make oven roasted cabbage steaks or grilled cabbage steaks with 10 minute prep. 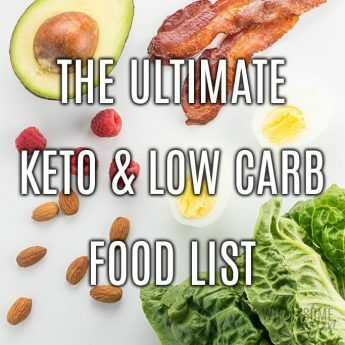 They are healthy, low carb, gluten-free, paleo, whole30, and totally delicious. We grilled for the first time over Memorial Day weekend, and I was so excited to try out my new cabbage steak recipe. I’ll admit my friend did the actual grilling, but I came up with the recipe and watched the time. (Totally counts, right?) And, I’m happy to report that the grilled cabbage steaks turned out just as amazing as the oven roasted cabbage steaks version I tried a couple weeks ago. Put simply, cabbage steaks are thick slices of cabbage that can be grilled, roasted or even fried. Today I’ll show you how to make grilled and roasted versions. And because these are cabbage steaks with bacon and garlic, I promise they are anything but boring. Friends, I promise that you are going to love these. They are absolutely delicious. What do cabbage steaks taste like, anyway? No, of course cabbage steaks don’t taste like a beef steak. They taste like cabbage. But, they taste like the most delicious way I’ve ever had cabbage. 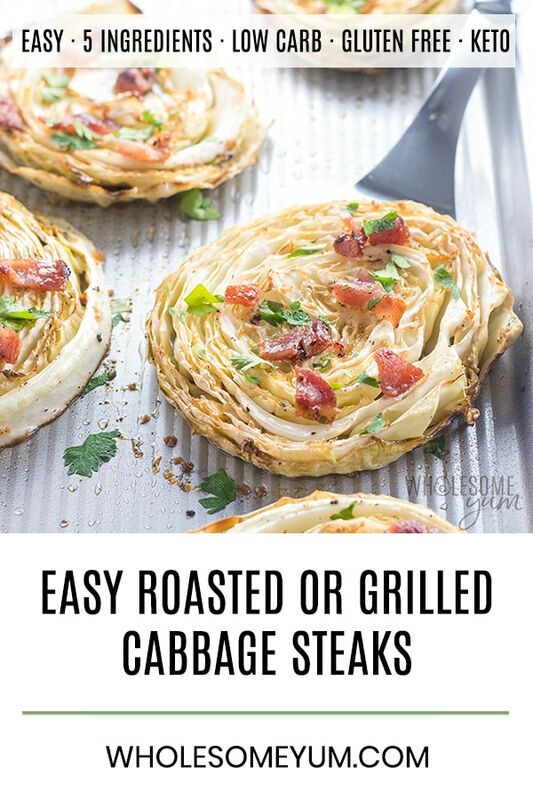 Instead of being mushy or lifeless, like you might picture boiled cabbage, these cabbage steaks with bacon and garlic are caramelized and slightly crispy at the edges. 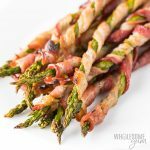 And did I mention that they are infused with bacon and garlic? The method for how to prepare cabbage steaks is super simple. The key is to marinate them. Whether you are making grilled cabbage steaks or oven roasted cabbage steaks, the marinade is the same. Start by frying some bacon on the stove. You’ll top the cabbage steaks with bacon later. Reserve the bacon fat for the marinade! Just make sure you let it cool before pouring it into a plastic bag, so that it doesn’t melt the plastic. Seal and shake the bag to mix it all together, then place the cabbage steaks inside and seal again. Move them around so that they get covered in the marinade as much as possible. Stick the bag in the fridge for 30 minutes. You can even do this overnight. Now you just have to choose… do you want roasted cabbage steaks in the oven, or grilled cabbage steaks outside? Having these method options means that you can make this cabbage steak recipe year-round. Yay! I’ll cover the method for how to make cabbage steaks in the oven first. This was how I tried them initially, when it wasn’t quite warm enough to grill yet. How long to roast cabbage steaks depends on the oven temperature and thickness of the cabbage steaks. I wanted them to caramelize nicely and I’m super impatient, so I prefer to make roasted cabbage steaks at 425 degrees. Speed was also why I cut the cabbage to 3/4-inch thickness. That was thin enough to cook quickly and have maximum surface area to caramelize, but thick enough where it wasn’t difficult to do. Arrange the cabbage steaks with garlic from the marinade on a large baking sheet and roast for about 30-35 minutes, until the edges are crispy and the cabbage is tender. It took 33 minutes in my oven. I use this non-stick sheet pan when I make roasted cabbage steaks. It has a silicone coating that is PTFE, PFOA and BPA free, and the non-stick surface is awesome. I don’t even need to line the pan. If your pan’s non-stick surface isn’t great, just line it with foil or parchment paper first, and grease well. But, I find that using a pan without lining gets the cabbage a bit more crispy. If you want to have fewer dishes to wash, you can use the same pan for frying the bacon and then roasting the cabbage steaks in the oven! I always use my favorite hard-anodized griddle pan for frying bacon. It has a little spout in the corner, which makes it convenient to then pour the bacon fat into the marinade for this cabbage steak recipe. And, the non-stick surface is also amazing (also PTFE, PFOA and BPA free), so if you use this pan you don’t need to line it either. 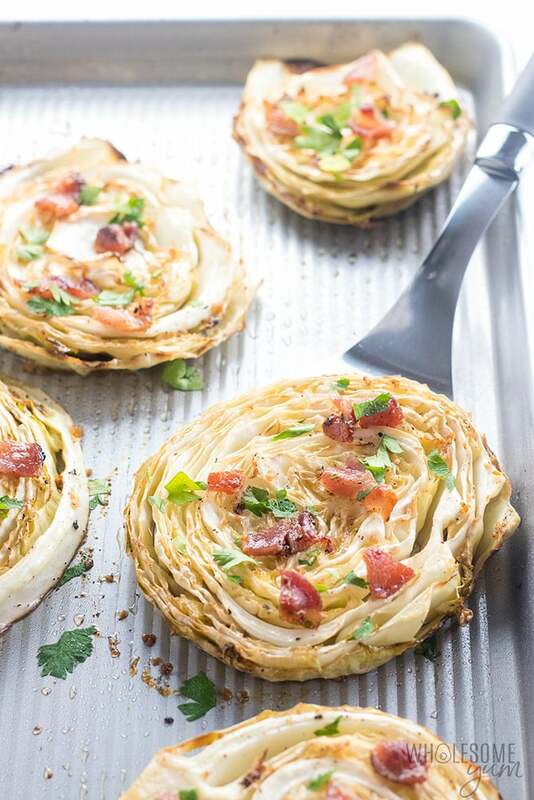 To use the griddle pan for the roasted cabbage steaks in the oven, you’ll need to reduce the oven temperature to 400 degrees, because that is the maximum that the pan can support. This will increase the cooking time by about 10 minutes. Let’s face it – it’s June and many of us don’t want to turn on the oven! Another reason to make grilled cabbage steaks. And the good news is, grilled cabbage steaks are much faster than oven roasted. The marinating process is the same, but they are so quick to make on the grill. Similar to the oven, how long to grill cabbage steaks depends on your grill temperature and thickness of the cabbage. A general guideline is 4-7 minutes on each side, over medium heat. But, this will vary depending on your grill. Watch closely to see for yourself how much time you need. The cabbage steaks are done when they start to soften and the edges get a bit charred. Do not grill cabbage steaks on foil. Trust me, I tried! 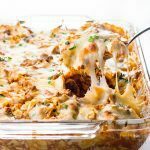 You get mushy cabbage that doesn’t get crispy or caramelized. You need to place the cabbage steaks directly onto the grill. You’ll have some leftover pieces. Since you are placing the cabbage steaks on the grill directly, smaller pieces would fall through. So for the grilled version of the cabbage steak recipe, make sure to only place the pieces on the grill that stay together well. You can reserve the smaller pieces and pan fry them later, if you want. 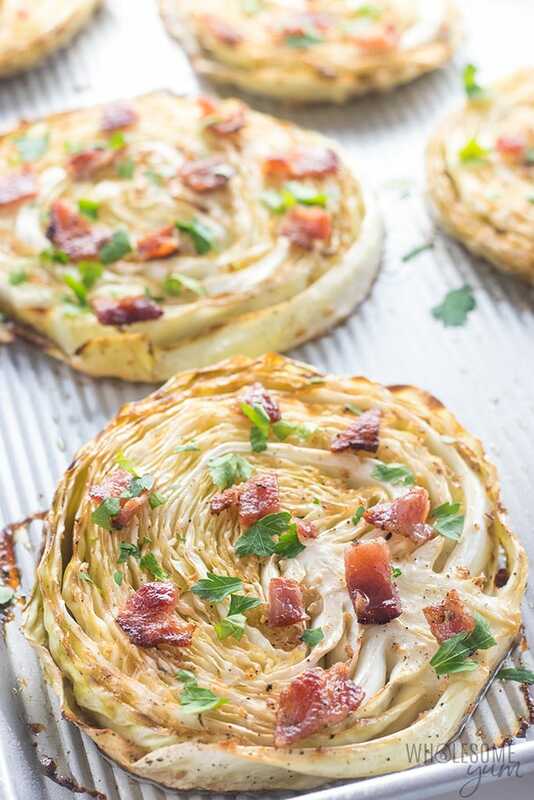 Whether you made grilled cabbage steaks or roasted cabbage steaks, don’t forget to top them with the bacon you made in the beginning! I like to sprinkle with a little parsley too, but that’s totally optional. What to eat with cabbage steaks will partly depend on your preferences. How much of a carnivore are you? Are your grilled or roasted cabbage steaks your main course, or a side dish? We like our meat, so we usually serve cabbage steaks as a side dish. Ironically, my favorite way to enjoy them is alongside a simple beef steak (or even filet mignon when they are on sale). 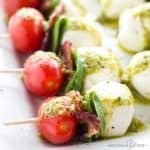 They pair well with juicy burgers (bunless at our house! ), too. You can even enjoy them with some chicken! 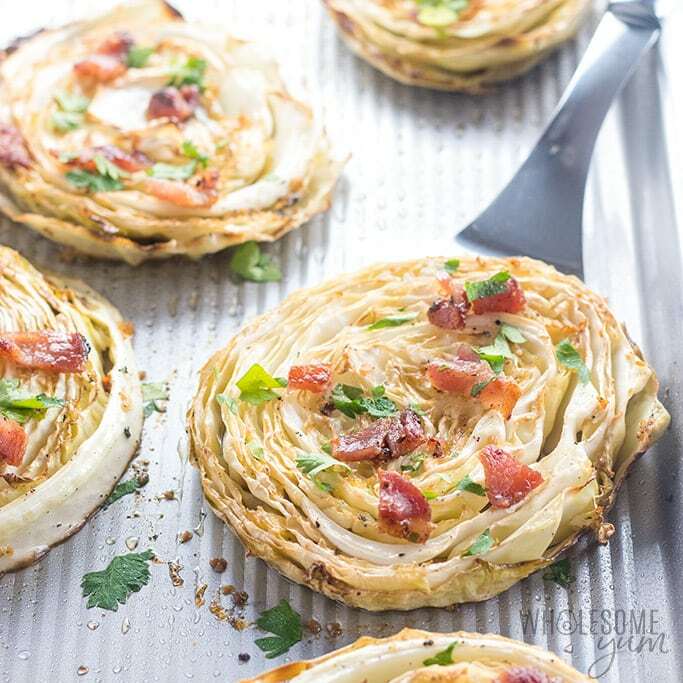 If you want a lighter meal, you can also serve grilled cabbage steaks with bacon and garlic as your main course. 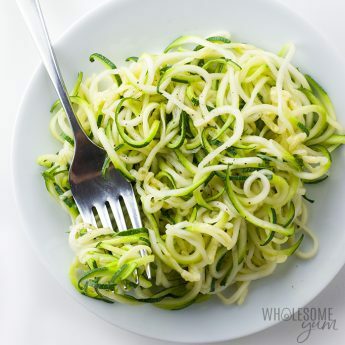 Pick any of my low carb side dishes to go along, if you really want a veggie-centric meal. 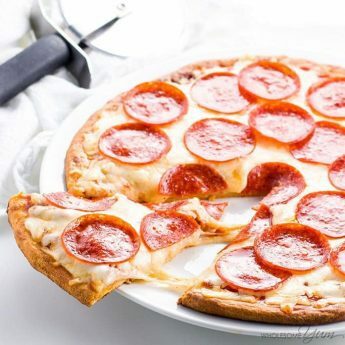 Just know that they are relatively light – albeit deceptively filling! Place the slices of bacon onto a large, cold pan. Place on the stove and turn to medium-low heat. Fry the bacon for 8-10 minutes, until crispy, flipping as needed. Meanwhile, cut the cabbage into 3/4-in (2 cm) thick slices. In a large resealable plastic bag, combine the olive oil, lemon juice, sea salt, and black pepper. Remove the bacon from the pan and set aside to drain, leaving behind the bacon fat in the pan. Add the minced garlic and saute for about a minute, until fragrant. Let the pan with bacon fat cool for 5-10 minutes. When the bacon fat has cooled enough to not melt the plastic, pour the bacon fat (along with the sauteed garlic) into the plastic bag. Scoop any remaining garlic with a spatula and add it in. Seal and mix well to form the marinade. Add the sliced cabbage steaks to the marinade bag. Coat well. Refrigerate for at least 30 minutes. Grill cabbage steaks for about 4-8 minutes on each side, until tender and crispy on the edges. To serve, top with cooked bacon and parsley for garnish (optional). Grease a large baking sheet well. (You can line with foil or parchment paper if you prefer. 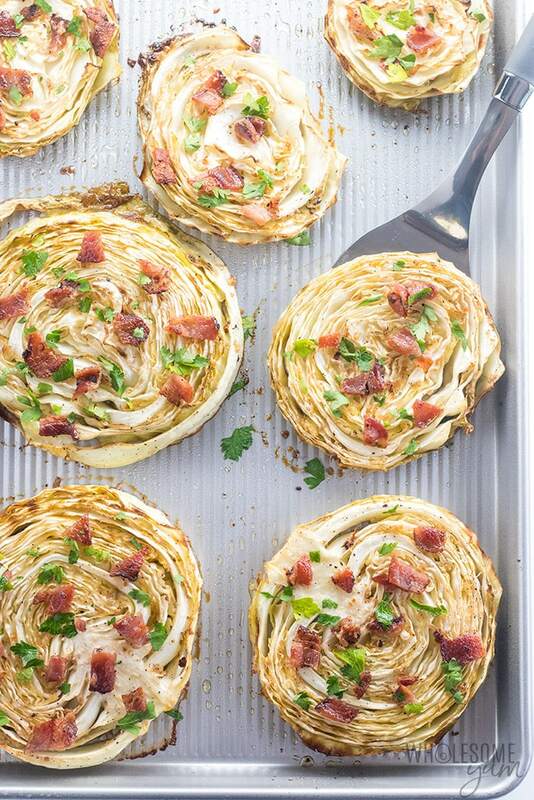 Arrange the cabbage steaks in a single layer. Roast cabbage steaks in the oven for about 30-35 minutes, until tender and crispy on the edges. Click or tap on the image below to play the video. It's the easiest way to learn how to make Cabbage Steaks! How did you cut the cabbage to be sliced that way for the cabbage steaks? 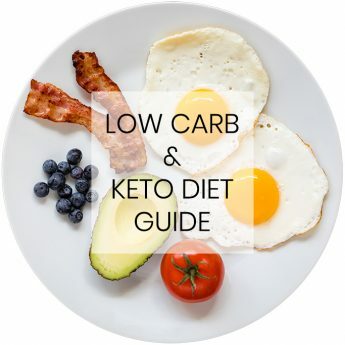 I love your website it’s by far my favorite thank you so much for sharing your wonderful ideas and recipes! Hi Nikole, Just slice the whole cabbage into 3/4-inch slices. It’s similar to the method for the roasted garlic cauliflower here – I have a photo for that one of how it looks. Just leave the slices whole of the cabbage instead of cutting them into smaller pieces like you would for the cauliflower. I’m so glad you like the recipes! This sounds like it will be delicious and a great presentation. Can’t wait to try. I hope you like it, Fran! Have a great day! 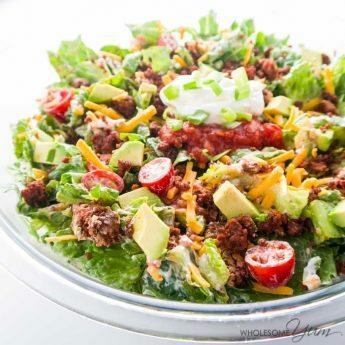 Thank you for sharing, love the sound of this recipe and am trying it tomorrow for a side! 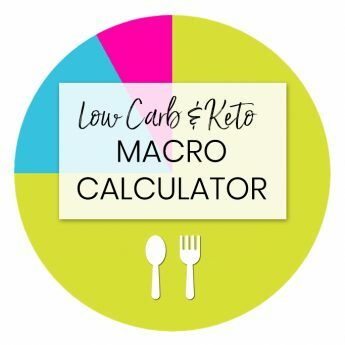 Question, where did you get the servings calculator? That’s so cool!! Thank you, Stacey, hope you like it! The calculator is coded into my website. Thank you so much, Rayne! I’m glad you both liked it. This sounds absolutely DELICIOUS! Can’t wait to try it! May even try using brussel sprouts next time! Thank you, Michele! I love the idea with brussels sprouts. Thank you, Jason! Please let me know if you try them.